The move gives sweeping powers to security forces to arrest and detain suspects, and comes amid a deepening political crisis in Maldives as President Abdulla Yameen defies the Supreme Court. 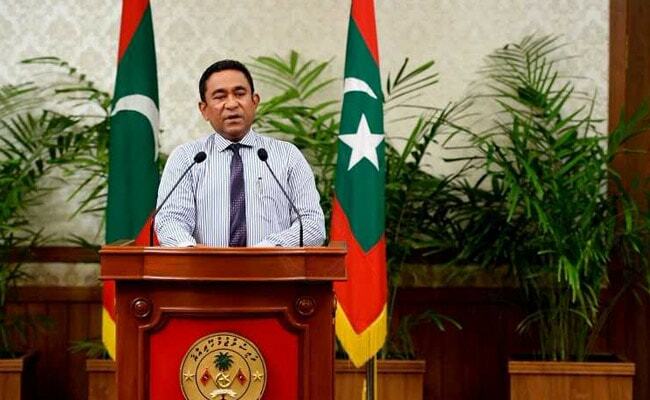 Maldives President Abdulla Yameen on Monday declared a state of emergency, ordered security forces into the supreme court and arrested a former president, in moves the opposition called a "purge" in the Indian Ocean island nation. Maldives police also arrested Chief Justice Abdulla Saeed and another Supreme Court judge on Tuesday, dramatically escalating the legal battle with the archipelago's top court. Police said in a Twitter message they had arrested Saeed and Supreme Court Judge Ali Hameed "for an ongoing investigation". The gave no details about the allegations or charges against the two judges. The president has defied a Supreme Court ruling handed down last week, which revoked terrorism charges against nine leading opposition figures including the country's first democratically elected president, Mohamed Nasheed, who is now in exile. The court ordered the opposition figures, six of whom are being held in the country's main jail on a sparsely inhabited island, to be freed. "The President has been compelled to declare a state of emergency due to the risk currently posed to national security," said a statement from Yameen's office on Monday. "Implementation of the Supreme Court ruling is - in its current form - incompatible with maintenance of public safety." Police arrested another former president, Maumoon Abdul Gayoom -- who is also Yameen's half-brother -- at his residence along with his son-in-law. Gayoom ruled the country for 30 years until 2008, and is now in the opposition. Gayoom's son Faris is one of the jailed opposition figures ordered freed by the court. In a recorded video sent to social media, Gayoom said he was being taken to the prison island of Dhoonidhoo: "I have not committed any crime. This arrest is unlawful. I will remain strong, and I ask the beloved people to remain strong." Yameen, who has held his position since 2013, faces mounting pressure at home and from the United States and India to obey the court's order. The Maldives is made up of 26 coral atolls and 1,192 islands. Politics centres on the tiny but densely populated capital Male. China, the United States and India issued travel advisories for the Maldives, a country of 400,000 people best known as a beach paradise for the tourists that provide most of its foreign currency revenue. The tumult comes during the peak tourism season. Tourism brought in $2.7 billion of revenue for the Maldives in 2016. As midnight approached, roads leading to the Supreme Court had been barricaded. At one spot, police with batons charged protesters to disperse them. "I just spoke to the Chief Justice and he told me that the gates of the Supreme Court (are) being stormed by the military. He is inside and nobody can go out or come in," Husnu Al Suood, the president of Maldives Bar Association and a former attorney general, told Reuters late on Monday. "The emergency means the Supreme Court activities are suspended and nobody is in charge of the judiciary," he said. A court official later confirmed that state security forces had broken into the building and were not allowing its judges to leave. "It is a purge of the political leadership, the parliament and the judiciary," said opposition legislator Eva Abdulla. The U.S. National Security Council released a statement on Twitter saying, "The Maldivian government and military must respect the rule of law, freedom of expression, and democratic institutions. The world is watching." The U.S. State Department said it was "troubled and disappointed" by the state of emergency and the failure by the president, army and police to obey a lawful Supreme Court ruling. "President Yameen has systematically alienated his coalition, jailed or exiled every major opposition political figure, deprived elected members of parliament of their right to represent their voters in the legislature, revised laws to erode human rights ... and weakened the institutions of government," it said in a statement. Amnesty International said that the 15-day emergency declaration must not become a licence for further repression. "The Maldivian authorities have an appalling track-record of suppressing freedom of expression and any form of opposition, a pattern of behaviour that has intensified over recent years," said Dinushika Dissanayake, Amnesty's Deputy South Asia Director. 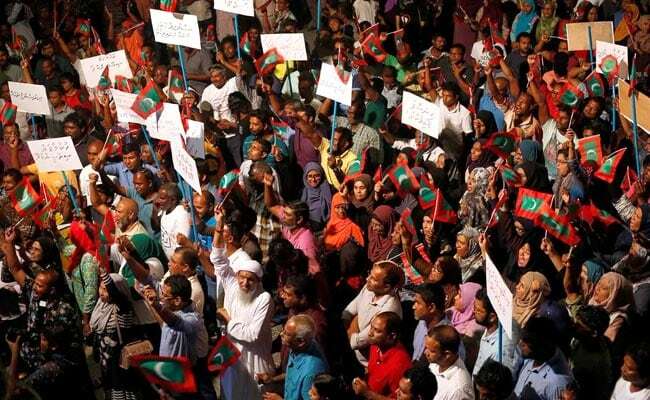 The Maldives has experienced political unrest since Nasheed, the island's first democratically elected leader, was forced to quit amid a mutiny by police in 2012. The following year, Yameen defeated Nasheed in an election that Nasheed's supporters say was rigged. Nasheed was jailed on terrorism charges but was allowed to go to Britain for medical treatment in January 2016. He has lived in exile since and is currently in Sri Lanka. "This deliberate refusal by the government to uphold the constitution further destabilises the Maldives and wider Indian Ocean security," Nasheed said in a statement on Monday. Under the country's constitution, the declaration of a state of emergency should be submitted to parliament. In the event of a dispute about the declaration, the Supreme Court is meant to rule on its validity. With the court effectively suspended, it was not immediately clear how that might happen. In its ruling last Thursday, the Supreme Court said it found that prosecutors and judges had been influenced "to conduct politically motivated investigations" into the allegations levelled at Nasheed, former vice president Ahmed Adeeb and the other opposition leaders. The court ordered fresh investigations and trials to be held. The ruling has energised an opposition that hopes Nasheed will be allowed to return home to run against Yameen in a presidential election due in October. On Monday, before the emergency was declared, a minister quit in protest at the government's defiance of the Supreme Court. "It is not possible for my conscience to accept the lack of answers to the way the government is dealing with the orders of the highest court on state institutions," Hussain Rasheed, the state health minister, said in his resignation letter.